Micro markets are where the growth is in today’s refreshment services industry. But for many refreshment service operators, expanding into this highly capital-intensive technology can be fraught with uncertainties. After all, the technology is barely less than a decade old, and investing in it requires a fair amount of research for the average operator. Bernick’s, a full-service refreshment services company based in Waite Park, Minn., has focused on micro market opportunities in recent years and has studied the available micro market systems. 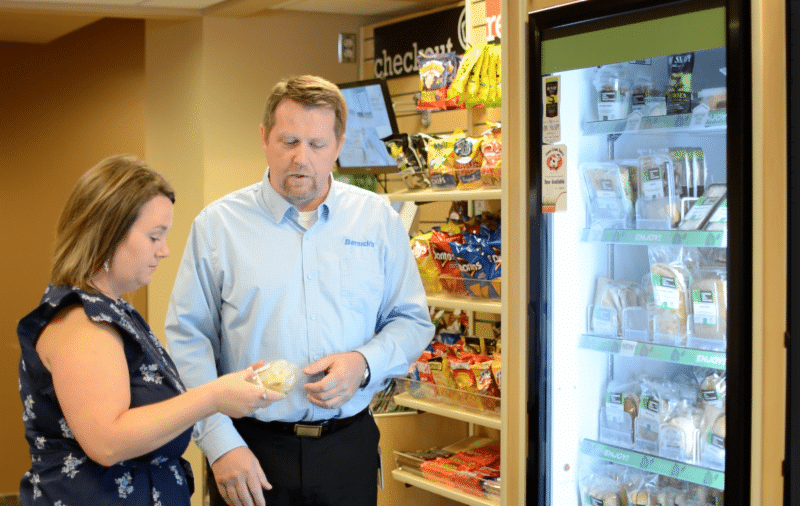 Reed Stevens, the company’s director of vending, shared his insights with Vending Technology News on the key considerations for choosing a micro market supplier. Stevens noted that 60 to 70 percent of the company’s new business is for micro markets. Cost is always an important factor when investing in any technology. Micro market kiosk costs can vary by a few thousand dollars, Stevens said, depending on the features. Hence, determining the features is one of the first considerations in choosing a micro market supplier. For most operators, payment options are an important feature when choosing a micro market kiosk. Customers today want as many payment options as possible, such as cash, credit card, mobile payment or a proprietary, online payment account. Stevens has found that offering online payments is very popular with customers. Such payments typically require some type of customer identification, which can be a credit card or a fingerprint. One of the newer types of identification is facial recognition, which most micro market kiosks don’t yet offer. It is important to have a provider that keeps up with new identification methods, Stevens said, such as retinal scanning, and with new payment methods such as bitcoin. “Having a provider that is willing to look at that and help through that process, that’s pretty important as we look forward to what’s coming down the pike in the next five years or 10 years,” he said. Transaction security for payments is also important, Stevens said. Payment equipment should include end-to-end encryption to ensure user privacy when making a purchase using a payment card at the kiosk. Connectivity is also important. As Wi-Fi has become more prevalent in recent years, it is important to have a kiosk that can connect to a Wi-Fi network in addition to an ethernet, Stevens said. Some customer locations don’t want to provide an ethernet line for security considerations. Hence, a wireless router is needed. From the operator’s standpoint, the ability of the kiosk touchscreen to run promotional offers can also be important, Stevens said. Operators like being able to offer discounts on certain products or combination offers for specific time periods. The ability to display nutritional and ingredient information on the touchscreen has proven to be an important feature for some customers. The need to display nutrition and ingredient information on a screen is less important for a micro market than for a vending machine, however, since in a micro market, customers can actually pick up and examine a product, which they can’t do at a vending machine. As a refreshment service provider, integration with existing vending management system software is also an important consideration in selecting a micro market kiosk. Integration with existing software is especially important if the company is pre-kitting its routes, but it is also important to provide visibility for the company’s internal financial reports. “You want to have the ability to capture any data that’s happening in a micro market into your vending management system,” Stevens said. VMS systems typically capture data on warehouse inventory, sales inventory, machine data and more. “When you talk about micro market systems, you want to have the ability to capture that data also,” he said. As with a vending machine, the operator wants to have sufficient inventory to service the micro market on a timely basis. Today’s VMS software can also provide service alerts for vending machines. Most micro market software on the market today integrates with existing VMS software, he said. Bernick’s is currently using Cantaloupe Systems’ VMS. It also makes sense to work with a provider that offers different size kiosks to accommodate different location requirements, Stevens said. Most of Bernick’s micro market installations are for countertop models. “It gives us a little more merchandising space,” Stevens said. The tablet offering makes sense for mid-size accounts that want to have a micro market but would find a kiosk cost prohibitive. The tablet with a card swipe is about half or a third the investment of a countertop kiosk. “That’s a less expensive alternative, and it gives them (the customer) the ability to have a kiosk where they can use some cashless and some other payment methods to make the purchases with,” he said. Surveillance cameras and DVRs are another consideration when deploying a micro market. Some states require a surveillance system to monitor activity 24/7 and retain the footage for 14 days, Stevens said. 365 Retail Markets provides the surveillance camera and DVR with all micro market orders. The surveillance equipment gets shipped separately as part of the order. “It’s kind of nice that we can order it all at one time rather than trying to place two or three orders for the different pieces when we build a micro market,” Stevens said. Micro market shelving is another consideration. Some micro market providers offer shelving. Bernick’s sources its shelving from a different company. In choosing the shelving, considerations include the quality and durability. For most customers, making the switch from a vending bank to a micro market creates an opportunity to redesign the break room, Stevens noted. Oftentimes, they repaint the area and replace the flooring. “The woodwork piece is a whole other animal when it comes to trying to fulfill our micro market requests,” he said. There are standard size cabinets available that will meet most requests. There are also some custom requests, so it pays to have a provider that can customize. Some operators may prefer to order everything from one supplier, Stevens said. Customer support is also an important factor. The micro market providers that Stevens is familiar with all offer support during the installation and process and are available 24/7 for ongoing support. The customer support is more important for micro markets than vending machines, he noted. If a vending machine goes down in a vending bank, there are usually other machines that are still working that the customer can use. “If a kiosk goes down, that’s their only payment method. Having that customer support is really important,” he said.